DoubleTake is our weekly post on two things that catch our eye during the week. 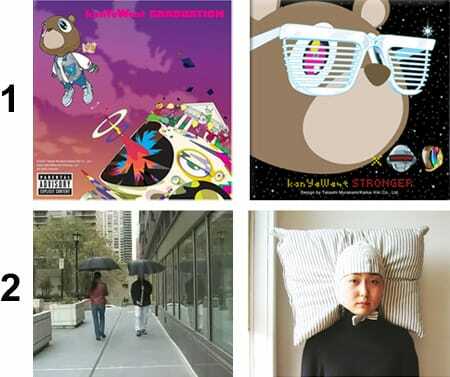 1 We’re excited for Kanye West’s upcoming Graduation album and definitely liking the album cover that’s been designed by pop art superstar Takashi Murakami. The two are a good fit – artists whose works are often defined by their referencing and repackaging of pop culture (see: the “Louis-Vuitton-Don” and Murakami Vuitton). 2 We stumbled upon the site of Joo Youn Paek, who has a collection of very creative and witty projects. We especially love the Polite Umbrella, which you can adjust as to not brush up against others (watch video), and the Pillowig, something I wouldn’t mind wearing to work once in a while. This entry was posted on Thursday, August 16th, 2007 at 11:30 pm and is filed under Uncategorized. You can follow any responses to this entry through the RSS 2.0 feed. Both comments and pings are currently closed.